RUSH: You know what this weekend is, folks? It is Super Bowl weekend. And something occurred to me today. I was in the process of — well, I was working. I was assembling the prep for today’s show and I ran across a couple stories on the NFL and Super Bowl. And I realized it was the first I had thought of it all week. I haven’t turned on ESPN. I have an NFL website that I read periodically, search and scan. It’s not immersive. I haven’t checked it out much this week. And it’s odd. This is odd. It’s unfamiliar for me. Normally the Super Bowl, I’m wanting to spend two or three hours of the show on it. Back when the Hutch was alive, we’d spend a lot of time talking to him, Ken Hutcherson, who played for the Cowboys and Seahawks. But man, I haven’t seen a thing. I haven’t seen a single news report out of Minneapolis this week, where the game is. I did see where the temperatures this weekend, 7 degrees for the high, minus 3 for lows, which is gonna make getting to and from the game a little inconvenient. But I don’t know. It’s really, really, really strange. And in addition to not being on my mind, it wasn’t even enough on my mind to be sad about the fact that it wasn’t on my mind, if that makes any sense. So here are the two stories that I found. And they may be related. The first one here is from Yahoo Finance news. “Sixteen Percent of NFL Fans Say They Will Not Be Watching the Super Bowl — Super Bowl 52 is just a few days away, and after NFL regular season TV ratings fell by nearly 10% this season on average, one of the biggest questions pundits and sports media have is: Will the Super Bowl ratings be good? If the results of a new survey from Seton Hall University are to be believed, the answer might be no. Seton Hall surveyed 706 Americans across the country, via landlines and cell phones.” Not a big sample. The first question they asked people is if they’re gonna watch. The upshot is 16% of NFL fans said they’re not gonna be watching this one. The next story is what we touched on earlier this week. This is an addendum to it. The NFL’s losing its core audience, according to an NBC/Wall Street Journal poll. “Adults who report following the NFL closely has dropped 9% since 2014. Just 51% of men aged 18 to 49 say they follow the NFL closely. Four years ago that was 75%.” Seventy-five percent to 51%. And I’m in that, I’m in that group. Well, I’m not because I’m over 49, but I’m in it attitudinally. This proves my point. Once you hit 50 the pollsters and the demographers don’t care about you ’cause they figure there’s no changing your mind. They’re not even blaming Minnesota for this. They’re blaming Philadelphia for it. Ha! The Eagles are blaming their own town. He-he-he. You know, I used to have a giant Super Bowl party. We’d bring out the Allen Brothers hot dogs and all that stuff, 50 or 60 people over, and I don’t even know of a Super Bowl party this year. If anybody that I know is having one, I haven’t heard about it. Yeah, I’ll watch it. I’m gonna watch it. I’m just saying that I’m not hyped. Maybe it’s ’cause it’s — I don’t know — neither of these two teams are my absolute favorites. I do have a favorite of these two, but I don’t know. It’s just weird. It’s just weird. And I never thought I would be losing interest. I’m not angry, like I’ve always said, I’m just sad. There are certain things that you lose interest in all throughout your life as you get older. It just happens. But this is one of these things I thought would be immune from that. 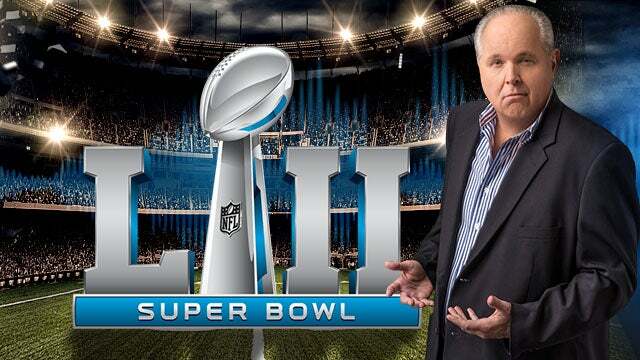 RUSH: I will predict that Janet Jackson will show up in the Super Bowl halftime and will not experience a wardrobe malfunction. As far as the game… Who’s playing again? Oh, yeah. I have no idea.